Alcohol can be your partner in both good times and bad times, as people drink alcohol when they are alone and sad or either they want to celebrate an occasion. 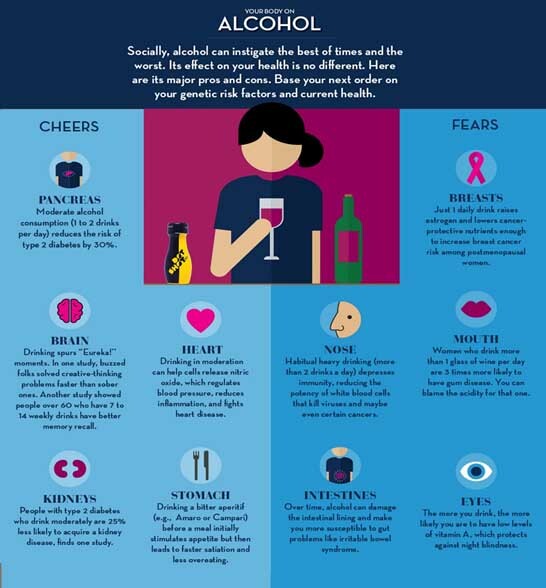 Not only on our mood Alcohol has similar effects on our body. Accumulating scientific evidence indicates that light to moderate drinking done daily may significantly reduce the risks of coronary heart disease (CHD), in contrast, excessive alcohol intake and binge drinking are toxic to both the heart and overall health and are the leading cause of premature death. Research has also shown J-shaped relationships between alcohol consumption and several adverse health outcomes, including all-cause mortality, CHD, diabetes, hypertension, congestive heart failure, stroke, dementia, and Raynaud’s phenomenon. Like exercise, alcohol consumption seems to be most cardioprotective when done daily and in moderation. However, increasingly excessive consumption is associated with proportional worsening of outcomes. Sobering statistics warn that moderate daily drinking is a slippery slope that many individuals cannot safely navigate. A responsible Drinking and taking DOTSHOT as your Last Shot of your drinks or before going to bed will help you to stay Refreshed and Healthy. Stay Fit and Happy as DOTSHOT Cares for You.